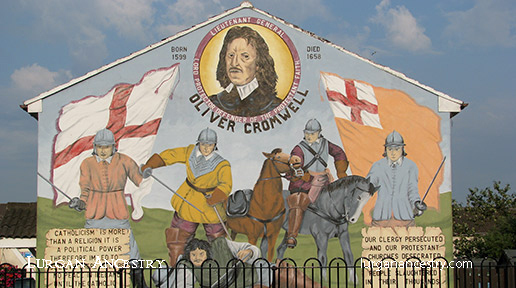 The Cromwellian war in Ireland (1649–53) was the conquest of Ireland by the forces of the English Parliament, led by Oliver Cromwell, during the Wars of the Three Kingdoms. With King Charles I beheaded, Cromwell invaded Ireland with his New Model Army on behalf of England's Rump Parliament in August 1649. His objective was to win back the country for Parliament and to inflict a final defeat on the Royalist cause, which had been supported by many of the Anglo-Irish families including the Magennis ‘clan’. Their rebellion was put down with a savagery at least equal to that of the Irish rebellion of 1641 His famous cry to his soldiers is still remembered and hated. He wanted them to oust the native Irish, and “to drive them to Hell or Connaught!”. Following the Irish Rebellion of 1641, most of Ireland came under the control of the Irish Catholic Confederation. In early 1649, the Confederates allied with the English Royalists, who had been defeated by the Parliamentarians in the English Civil War. 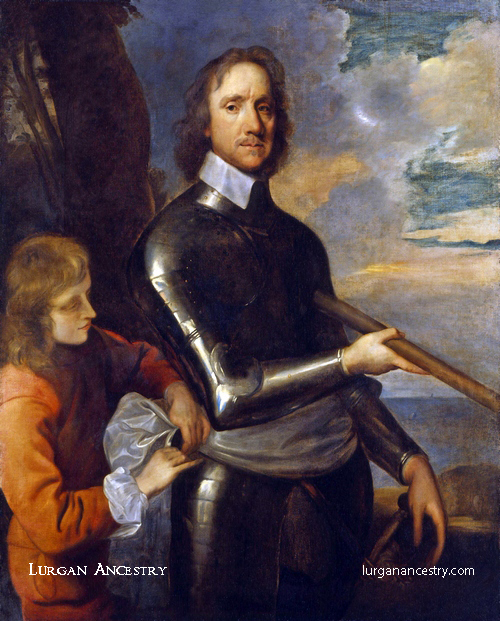 By May 1652, Cromwell's Parliamentarian army had defeated the Confederate and Royalist coalition in Ireland and occupied the country bringing to an end the Irish Confederate Wars (or Eleven Years' War). However, guerrilla warfare continued for a further year. Cromwell passed a series of Penal Laws against Roman Catholics (the vast majority of the population) and confiscated large amounts of their land. Arriving in Dublin on August 15, 1649, Cromwell thrilled the crowd at his welcoming with a promise to carry on “the great work against the barbarous and blood-thirsty Irish.” He chose an assault on Drogdeha, north of Dublin , as a useful lesson to all of Ireland that if they resist his assertion of English control of Ireland there would be an “effusion of blood.” Drogheda , located on the River Boyne, was well fortified by a wall which surrounded it. Its defences were led by Sir Arthur Aston with 3000 Royalists. Cromwell had 8000 troops, called his Ironsides, disciplined, daring, fanatical, and papist hating, and the best artillery of the time which easily breached the fortified walls of Drogheda . As customary, Cromwell asked for the city’s surrender with the promise of no reprisals. Aston refused to surrender, and the assault began on September 11, 1649. First, the Church of St. Mary was subject to bombardment and later St. Peter’s Church was set afire. When found, Aston was bludgeoned to death by his own wooden leg. The defenders put up a vigorous defence but when Drogheda fell, 3500 defenders and civilians of the city had been killed. Captured soldiers were sent to Barbados , and those brought to Dublin as prisoners were assigned backbreaking and dangerous work with scant rations, no shoes, no shelter, and tattered clothes. The lucky ones were sent to the West Indies . Hence, in Drogheda there is a street named Scarlett. The Parliamentarian reconquest of Ireland was brutal, and Cromwell is still a hated figure in Ireland. The extent to which Cromwell, who was in direct command for the first year of the campaign, was responsible for the atrocities is debated to this day. Some historians argue that the actions of Cromwell were within the then-accepted rules of war, or were exaggerated or distorted by later propagandists; these claims have been challenged by others. The impact of the war on the Irish population was unquestionably severe, although there is no consensus as to the magnitude of the loss of life. The war resulted in famine, which was worsened by an outbreak of bubonic plague. Estimates of the drop in the Irish population resulting from the Parliamentarian campaign range between 15–25%-50% and 83%. The Parliamentarians also deported about 50,000 people as indentured labourers. Some estimates cover population losses over the course of the Conquest Period (1649-52) only, while others cover the period of the Conquest to 1653 and the period of the Cromwellian Settlement from August 1652 to 1659 together. When Cromwell landed in Ireland, the only major town held by the Parliamentarians in Ulster was Londonderry, where Sir Charles Coote had made an unlikely alliance with Owen Roe O'Neill against Ormond's coalition of Royalists, Confederates, Ulster Scots and the Lagan Army. When Cromwell turned south towards the seaports of Leinster and Munster, he sent a detachment of 5,000 men under the command of Colonel Robert Venables to seize the towns and ports of eastern Ulster and to join forces with Coote. On 27 September, a party of Irish Royalists attacked Venables' camp at Dromore but was easily beaten off. 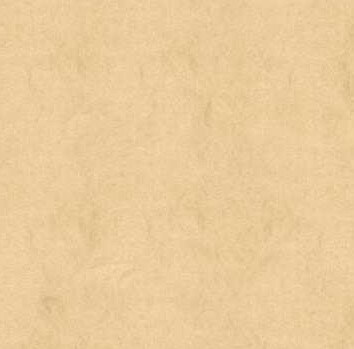 This proved to be the only serious opposition encountered by Venables' expedition during September. The Ulster Scots had grown disillusioned with Ormond's alliance with the Irish Catholics and many preferred to surrender to the Protestant Parliamentarians. The Scottish garrison at Belfast surrendered to Venables without a fight on 30 September. The most formidable force left to the Irish and Royalists was the 6,000 strong army of Ulster, formerly commanded by Owen Roe O'Neill, who died in 1649. However the army was now commanded by an inexperienced Catholic bishop named Heber MacMahon. While Colonel Venables marched through eastern Ulster, Sir Charles Coote advanced from Londonderry to attack the Royalists at Coleraine. When Coote approached Coleraine on 15 September, Protestants in the town opened the gates to him. Coote's forces then proceeded to massacre the garrison. Coote advanced southwards through County Antrim and joined forces with Venables near Belfast towards the end of October 1649. Their combined armies set about reducing isolated Royalist garrisons in north-eastern Ulster before advancing on Carrickfergus. The Ulster Army met a Parliamentarian army, composed mainly of British settlers and commanded by Charles Coote, at the Battle of Scarrifholis in County Donegal in June 1650. The Ulster army was routed and as many as 2,000 of its men were killed. In addition, MacMahon and most of the Ulster Army's officers were either killed at the battle or captured and executed after it. This eliminated the last strong field army opposing the Parliamentarians in Ireland and secured for them the northern province of Ulster. Coote's army, despite suffering heavy losses at the Siege of Charlemont, the last Catholic stronghold in the north, was now free to march south and invade the west coast of Ireland. So the parish of Donaghcloney, which was made up of 14 townlands, became ‘available' for plantation in 1649. It was split up amongst Cromwellian soldiers in Lord Deputy Fleetwood's Troop of Horse and Regiment of Foot, in lieu of pay. These men sold their newly acquired lands to the commander of the Regiment of Foot, Colonel Barrett; who, in turn passed the ownership of the western half of the parish to William Waring, a fellow officer in Cromwell's army. According to census records, Waring was in possession of the lands by 1659; i.e., immediately prior to the restoration of King Charles II in 1660. He built a large house on his estate in 1667, known as Waringstown House, which still stands today. Waringstown is situated 2¾ miles southeast of Lurgan. 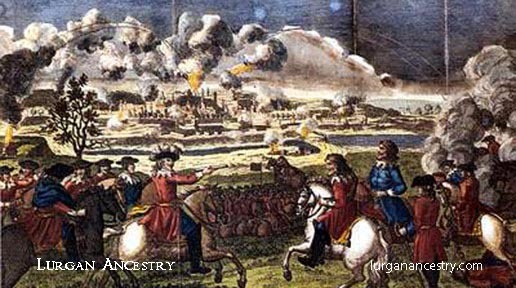 Just four years later, in 1671, King James II converted to Roman Catholicism; so the battle between Catholic and Protestant started up again with renewed enthusiasm. In 1688 Parliament invited William of Orange to take the throne. During the uprising of 1688-90 William Waring’s house was occupied for a while by Conn Magennis, who still saw himself as the rightful heir to the land. But in 1690 the Duke of Schomberg ousted him on his way south to the Boyne. Cromwell imposed an extremely harsh settlement on the Irish Catholic population. This was because of his deep religious antipathy to the Catholic religion and to punish Irish Catholics for the rebellion of 1641, in particular the massacres of Protestant settlers in Ulster. Also he needed to raise money to pay off his army and to repay the London merchants who had subsidised the war under the Adventurers Act back in 1640. Anyone implicated in the rebellion of 1641 was executed. Those who participated in Confederate Ireland had all their land confiscated and thousands were transported to the West Indies as indentured labourers. Those Catholic landowners who had not taken part in the wars still had their land confiscated, although they were entitled to claim land in Connacht as compensation. In addition, no Catholics were allowed to live in towns. Irish soldiers who had fought in the Confederate and Royalist armies left the country in large numbers to find service in the armies of France and Spain—William Petty estimated their number at 54,000 men. The practice of Catholicism was banned and bounties were offered for the capture of priests, who were executed when found. The Long Parliament had passed the Adventurers Act in 1640 (the act received royal assent in 1642), under which those who lent money to Parliament for the subjugation of Ireland would be paid in confiscated land in Ireland. In addition, Parliamentarian soldiers who served in Ireland were entitled to an allotment of confiscated land there, in lieu of their wages, which the Parliament was unable to pay in full. As a result, many thousands of New Model Army veterans were settled in Ireland. Moreover, the pre-war Protestant settlers greatly increased their ownership of land. Before the wars, Irish Catholics had owned 60% of the land in Ireland, whereas by the time of the English Restoration, when compensations had been made to Catholic Royalists, they owned only 20% of it. During the Commonwealth period, Catholic landownership had fallen to 8%. Even after the Restoration of 1660, Catholics were barred from all public office, but not from the Irish Parliament. The Cromwellian conquest completed the British colonisation of Ireland, which was merged into the Commonwealth of England, Scotland and Ireland in 1653–59. It destroyed the native Irish Catholic land-owning classes and replaced them with colonists with a British identity. The bitterness caused by the Cromwellian settlement was a powerful source of Irish nationalism from the 17th century onwards. Oliver Cromwell left Ireland on May 26, 1650 and had spent just nine months in Ireland, he left behind him death, exile, persecution, indentured slavery, and a form of 17th century ethnic cleansing. His name is forever associated by the Irish people with fevered anti-Catholicism and a burning hatred for the Irish people. Cromwell’s Settlement plan for Ireland can be fairly judged as being even more harmful to Ireland than his blood letting in 1649. After the Stuart Restoration in 1660, Charles II of England restored about a third of the confiscated land to the former landlords in the Act of Settlement 1662, but not all, as he needed political support from former parliamentarians in England. 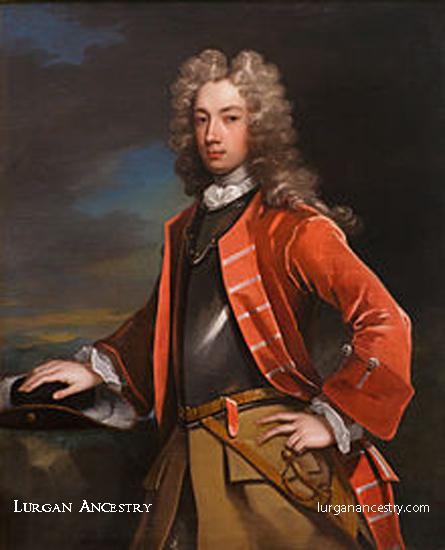 A generation later, during the Glorious Revolution, many of the Irish Catholic landed class tried to reverse the remaining Cromwellian settlement in the Williamite War in Ireland (1689–91), where they fought en masse for the Jacobites. They were defeated once again, and many lost land that had been regranted after 1662. As a result, Irish and English Catholics did not become full political citizens of the British state again until 1829 and were legally barred from buying valuable interests in land until the Papists Act of 1778.